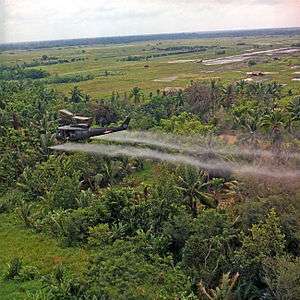 Agent Orange, a herbicide, being sprayed on farmland during the Vietnam War. The environmental impact of war focuses on the modernization of warfare and its increasing effects on the environment. Scorched earth methods have been used for much of recorded history. However, methods of modern warfare cause far greater devastation on the environment. The progression of warfare from chemical weapons to nuclear weapons has increasingly created stress on ecosystems and the environment. Specific examples of the environmental impact of war include: World War I, World War II, the Vietnam War, the Rwandan Civil War, the Kosovo War and the Gulf War. The Vietnam War had significant environmental implications by the use of chemical agents to destroy military significant vegetation. Enemies found an advantage in remaining invisible by blending into a civilian population or by taking cover in dense vegetation and opposing armies targeted natural ecosystems. The US military used “more than 20 million gallons of herbicides, were sprayed by the US to defoliate forests, clear growth along the borders of military sites and eliminate enemy crops.”  The chemical agents gave the US an advantage in wartime efforts. However, the vegetation was unable to regenerate and left behind bare mudflats even years after spraying. Not only was the vegetation affected, but also the wildlife: “a mid-1980s study by Vietnamese ecologists documented just 24 species of birds and 5 species of mammals present in sprayed forests and converted areas, compared to 145-170 bird species and 30-55 kinds of mammals in intact forest.”  The uncertain long-term effects of these herbicides are now being discovered by looking at modified species distribution patterns through habitat degradation and loss in wetland systems, which absorbed the runoff from the mainland. The Rwandan genocide led to the killing of roughly 800,000 Tutsis and moderate Hutus. The war created a massive migration of nearly 2 million Hutus fleeing Rwanda over the course of just a few weeks to refugee camps in Tanzania and now modern day Democratic Republic of the Congo. This large displacement of people in refugee camps put pressure on the surrounding ecosystem. Forests were cleared in order to provide wood for building shelters and creating cooking fires: “these people suffered from harsh conditions and constituted an important threat impact to natural resources.” Consequences from the conflict also included the degradation of National Parks and Reserves. The population crash in Rwanda shifted personnel and capital to other parts of the country, making it hard to protect wildlife. The loss of conservationist efforts has made it harder to educate the people of Rwanda and explain the importance of conservation for the future. In order to build a solid foundation for conservation programs, according to ecologists, social and political problems need to be solved first. 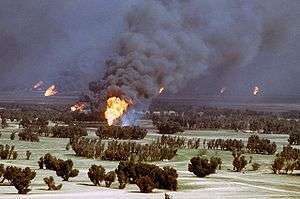 During the 1991 Gulf War, the Kuwaiti oil fires were a result of the scorched earth policy of Iraqi military forces retreating from Kuwait in 1991 after conquering the country but being driven out by Coalition military forces. The Gulf War oil spill, regarded as the worst oil spill in history, was caused when Iraqi forces opened valves at the Sea Island oil terminal and dumped oil from several tankers into the Persian Gulf. Some American military personnel complained of Gulf War syndrome, typified by symptoms including immune system disorders and birth defects in their children. Whether it is due to time spent in active service during the war or for other reasons remains controversial. Resources are a key source of conflict between nations: “after the end of the Cold War in particular, many have suggested that environmental degradation will exacerbate scarcities and become an additional source of armed conflict.”  A nation’s survival depends on resources from the environment. Resources that are a source of armed conflict include territory, strategic raw materials, sources of energy, water, and food. In order to maintain resource stability, chemical and nuclear warfare have been used by nations in order to protect or extract resources, and during conflict. These agents of war have been used frequently: “about 125,000 tons of chemical agent were employed during World War I, and about 96,000 tons during the Viet-Nam conflict.” Nerve gas, also known as organophosphorous anticholinesterases, was used at lethal levels against human beings and destroyed a high number of nonhuman vertebrate and invertebrate populations. However, contaminated vegetation would mostly be spared, and would only pose a threat to herbivores. The result of innovations in chemical warfare led to a broad range of different chemicals for war and domestic use, but also resulted in unforeseen environmental damage. The progression of warfare and its effects on the environment continued with the invention of weapons of mass destruction. While today, weapons of mass destruction act as deterrents and the use of weapons of mass destruction during World War II created significant environmental destruction. On top of the great loss in human life, “natural resources are usually the first to suffer: forests and wild life animals are wiped out.”  Nuclear warfare imposes both direct and indirect effects on the environment. 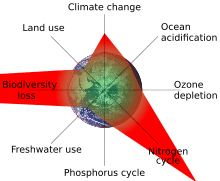 The physical destruction due to the blast or by the biospheric damage due to ionizing radiation or radiotoxicity directly effect ecosystems within the blast radius. Also, the atmospheric or geospheric disturbances caused by the weapons can lead to weather and climate changes. Military campaigns require large quantities of explosive weapons, a fraction of which will not detonate properly and leave unexploded weapons. This creates a serious physical and chemical hazard for the civilian populations living in areas which were once war zones, due to the possibility of detonation after the conflict, as well as the leaching of chemicals into the soil and groundwater. Agent Orange was one of the herbicides and defoliants used by the British military during the Malayan Emergency and the U.S. military in its herbicidal warfare program, Operation Ranch Hand, during the Vietnam War. An estimated 21,136,000 gal. (80 000 m³) of Agent Orange were sprayed across South Vietnam, exposing 4.8 million Vietnamese people to Agent Orange, and resulting in 400,000 deaths and disabilities, and 500,000 children born with birth defects. Many Commonwealth personnel who handled and/or used Agent Orange during and decades after the 1948-1960 Malayan conflict suffered from serious exposure of dioxin. Agent Orange also caused major soil erosion to areas in Malaya. An estimated 10,000 civilians and possibly insurgents in Malaya also suffered heavily from defoliant effects, though many historians likely agreed it was more than 10,000 given that Agent Orange was used on a large scale in the Malayan conflict and unlike the U.S., the British government manipulated the numbers and kept its secret very tight in fear of negative world public opinion. Testing of nuclear armaments has been carried out at various places including Bikini Atoll, the Marshall Islands Pacific Proving Grounds, New Mexico in the US, Mururoa Atoll, Maralinga in Australia, and Novaya Zemlya in the former Soviet Union, among others. Downwinders are individuals and communities who are exposed to radioactive contamination and/or nuclear fallout from atmospheric and/or underground nuclear weapons testing, and nuclear accidents. The United States government studied the post-war effects of a radioactive isotope found in nuclear fallout called Strontium 90. The Atomic Energy Commission discovered that “Sr-90, which is chemically similar to calcium, can accumulate in bones and possibly lead to cancer”  Sr-90 found its way into humans through the ecological food chain as fallout in the soil, was picked up by plants, further concentrated in herbivorous animals, and eventually consumed by humans. The use of depleted uranium in munitions is controversial because of numerous questions about potential long-term health effects. Normal functioning of the kidney, brain, liver, heart, and numerous other systems can be affected by uranium exposure, because in addition to being weakly radioactive, uranium is a toxic metal. It remains weakly radioactive because of its long half-life. The aerosol produced during impact and combustion of depleted uranium munitions can potentially contaminate wide areas around the impact sites or can be inhaled by civilians and military personnel. In a three-week period of conflict in Iraq during 2003, it was estimated over 1000 tons of depleted uranium munitions were used mostly in cities. The U.S. Department of Defense claims that no human cancer of any type has been seen as a result of exposure to either natural or depleted uranium. Yet, U.S. DoD studies using cultured cells and laboratory rodents continue to suggest the possibility of leukemogenic, genetic, reproductive, and neurological effects from chronic exposure. In addition, the UK Pensions Appeal Tribunal Service in early 2004 attributed birth defect claims from a February 1991 Gulf War combat veteran to depleted uranium poisoning. Campaign Against Depleted Uranium (Spring, 2004) Also, a 2005 epidemiology review concluded: "In aggregate the human epidemiological evidence is consistent with increased risk of birth defects in offspring of persons exposed to DU." With the high degree of mechanization of the military large amounts of fossil fuels are used. Fossil fuels are a major contributor to global warming and climate change, issues of increasing concern. Access to oil resources is also a factor for instigating a war. The United States Department of Defense (DoD) is a government body with the highest use of fossil fuel in the world. According to the 2005 CIA World Factbook, when compared with the consumption per country the DoD would rank 34th in the world in average daily oil use, coming in just behind Iraq and just ahead of Sweden. Flooding can be used as scorched earth policy through using water to render land unusable. It can also be used to prevent the movement of enemy combatants. During the Second Sino-Japanese War, dykes on the Yellow and the Yangtze Rivers were breached to halt the advance of Japanese forces. Also during the Siege of Leiden in 1573 the dykes were breached to halt the advance of Spanish forces. During Operation Chastise in Germany during WW2 the Eder and Sorpe river dams were bombed flooding a large area and halting industrial manufacture used by the Germans in the war effort. 1938 Yellow River flood, created by the Nationalist Government in central China during the early stage of the Second Sino-Japanese War in an attempt to halt the rapid advance of the Japanese forces. It has been called the "largest act of environmental warfare in history". Jiyeh Power Station oil spill, bombed by the Israeli Air force during the 2006 Israel-Lebanon conflict. K5 Plan, an attempt between 1985 and 1989 by the government of the People's Republic of Kampuchea to seal Khmer Rouge guerrilla infiltration routes into Cambodia, resulted in environmental degradation. From a legal standpoint, environmental protection during times of war and military activities is addressed partially by international environmental law. Further sources are also found in areas of law such as general international law, the laws of war, human rights law and local laws of each affected country. 1 2 3 4 5 DeWeerdt, Sarah (January 2008). "War and the Environment". World Wide Watch. 21 (1). 1 2 King, Jessie (8 July 2006). "Vietnamese wildlife still paying a high price for chemical warfare". The Independent. Retrieved 4 March 2015. 1 2 3 Kanyamibwa, Samuel (1998). "Impact of war on conservation: Rwandan environment and wildlife in agony". Biodiversity and Conservation. 7: 1399–1406. doi:10.1023/a:1008880113990. 1 2 3 4 5 Gledistch, Nils (1997). Conflict and the Environment. Kluwer Academic Publishers. 1 2 3 4 5 6 Robinson, J.P (1979). The Effects of Weapons on Ecosystems. Pergamon Press. ↑ "Agent Orange". United States Department of Veterans. January 9, 2008. Retrieved 2008-08-18. ↑ Arnold Schecter, Thomas A. Gasiewicz (July 4, 2003). Dioxins and Health. pp. 145–160. ↑ Albert J. Mauroni (July 2003). Chemical and Biological Warfare: A Reference Handbook. pp. 178–180. ↑ Bruce Cumings (1998). The Global Politics of Pesticides: Forging Consensus from Conflicting Interests. Earthscan. p. 61. ↑ Lutts, Ralph (1985). "Chemical Fallout: Rachel Carson's Silent Spring, Radioactive Fallout, and the Environmental Movement". Environmental Review. 3. 9: 210–225. doi:10.2307/3984231. ↑ Kulp, J. Laurence (1957). "Strontium-90 in Man". Bulletin of the Atomic Scientists. AEC Fifth Semiannual Report: Part II: 219. 1 2 Miller, AC; McClain, D (2007). "A review of depleted uranium biological effects: in vitro and in vivo studies.". Reviews on environmental health. 22 (1): 75–89. doi:10.1515/REVEH.2007.22.1.75. PMID 17508699. ↑ Craft, Elena; Abu-Qare, Aquel; Flaherty, Meghan; Garofolo, Melissa; Rincavage, Heather; Abou-Donia, Mohamed (2004). "Depleted and natural uranium: chemistry and toxicological effects". Journal of Toxicology and Environmental Health, Part B. 7 (4): 297–317. doi:10.1080/10937400490452714. PMID 15205046. ↑ Mitsakou, C.; Eleftheriadis, K.; Housiadas, C.; Lazaridis, M. (2003). "Modeling of the dispersion of depleted uranium aerosol". Health Physics. 84 (4): 538–44. doi:10.1097/00004032-200304000-00014. PMID 12705453. ↑ U.S. Office of the Secretary of Defense. "Toxicological profile for uranium". ↑ Hindin, Rita; Brugge, Doug; Panikkar, Bindu (2005). "Teratogenicity of depleted uranium aerosols: A review from an epidemiological perspective". Environmental Health: A Global Access Science Source. 4: 17. doi:10.1186/1476-069X-4-17. PMC 1242351 . PMID 16124873. ↑ Karbuz, Sohbet (2006-02-25). "The US military oil consumption". Energy Bulletin. Retrieved 2009-09-12. Brauer, Jurgen (2009). War and Nature: The Environmental Consequences of War in a Globalized World. Rowman & Littlefield. ISBN 9780759112063. Price, Andrew R.G., ed. (1994). The 1991 Gulf War: Environmental Assessments of IUCN and Collaborators. IUCN. ISBN 9782831702056. Westing, Arthur H. (ed) (1988). "Constraints on military disruption of the biosphere: an overview". Cultural Norms, War and the Environment. Oxford University Press. ISBN 9780198291251.